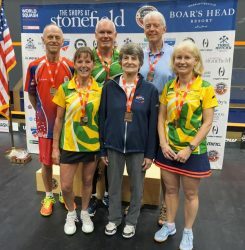 Australia emerged with six gold medals in the WSF World Masters in the USA state of Virginia – where Men’s O60 champion Geoffrey Davenport claimed a record-equalling sixth World Masters title and Women’s O45 champion Sarah Fitz-Gerald extended her remarkable unbeaten international record since 2001! 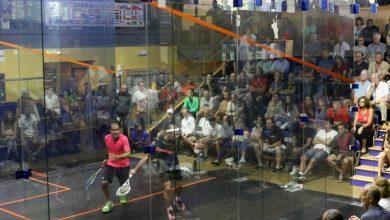 More than 750 players from a record 63 nations competed in the 15th edition of the biennial World Squash Federation staged at the McArthur Squash Center at the Boar’s Head Sports Club in Charlottesville – featuring 19 men’s and women’s events in categories ranging from Over-35 to Over-80. 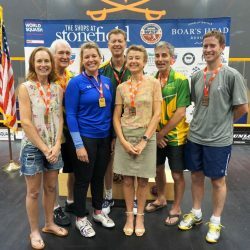 Players from Australia headed the gold medal table, followed by England with five, Canada and hosts USA two, and single golds won by Netherlands, South Africa, Ireland and Cayman Islands. 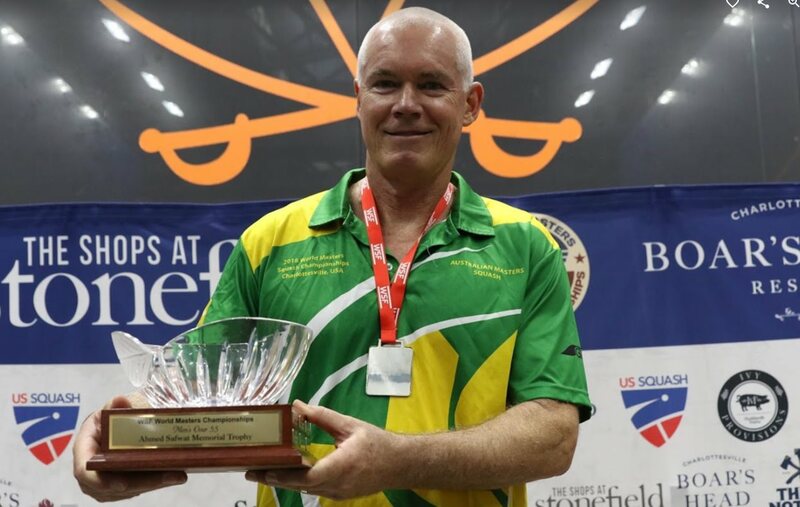 After first winning World Masters gold in the O45 event in 2003 in Finland – then claiming his fifth in the O55 championship in Hong Kong in 2014 – 60-year-old Geoffrey Davenport (pictured above) was making his debut in the O60 event in Charlottesville. 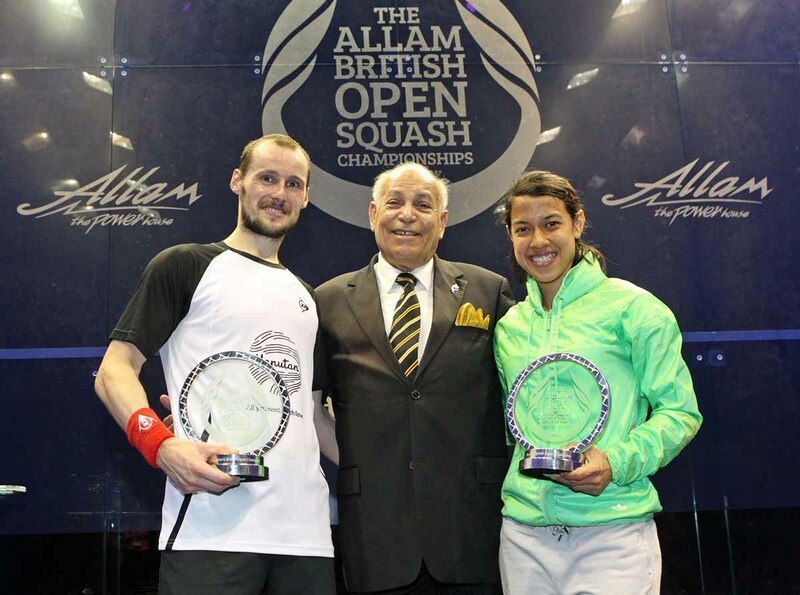 The top seed from Sydney breezed through to the final without dropping a game, then despatched surprise opponent Juan Mendez, an unseeded player from Mexico, 11-5, 11-5, 11-2. 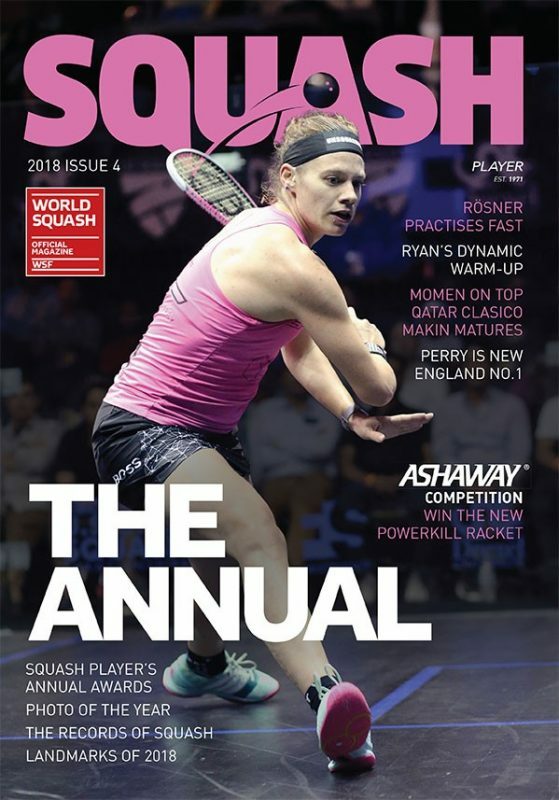 Former world number one Sarah Fitz-Gerald enjoyed a distinguished career on the professional circuit where she won a then record five World Open titles. 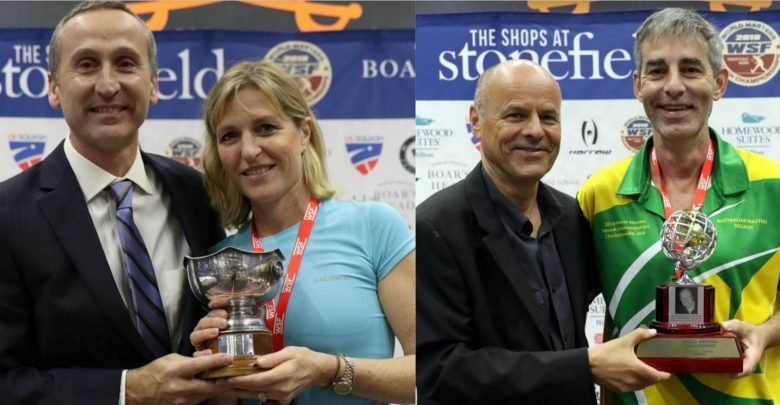 A firm favourite to defend her World Masters O45 title, the 49-year-old from Melbourne did so in some style – seeing off fellow countrywoman Susan Davis in the final 11-5, 11-4, 11-3. 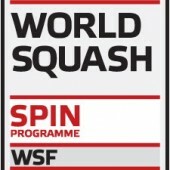 The title is Fitz-Gerald’s third World O45 in a row, and follows three British Open Masters titles, a World Masters Games trophy and a World Masters O35 gold medal. 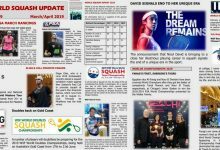 The latest success also extends her winning run in all international events to 17 years – after suffering her most recent defeat in August 2001 in the semi-finals of the Hong Kong Open – to NZ rival Leilani Joyce! 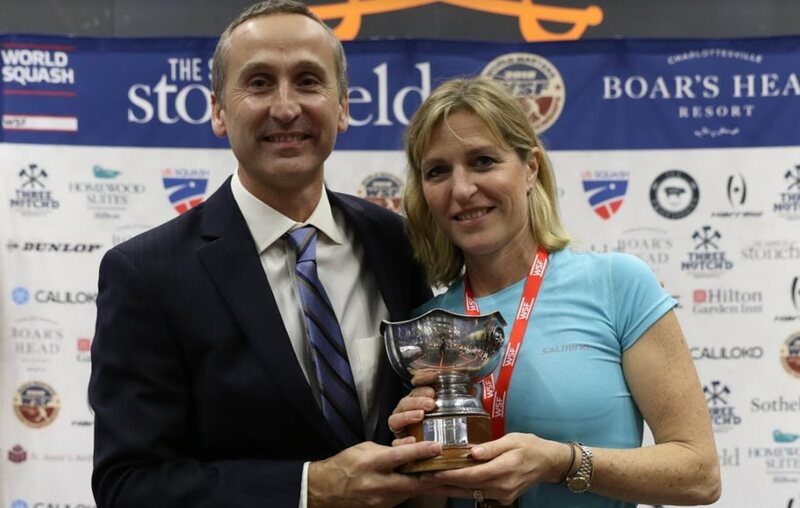 “I love this sport, I’ve been playing since I was a kid,” said Fitz-Gerald, now a WSF Vice President (pictured above with Championship Director Mark Allen), after collecting her latest gold medal. “Just because I’m old and retired doesn’t mean I can’t keep playing. I still have the fire burning inside, and I think all of the old pros here still have that fire burning inside and want to see what they can do. 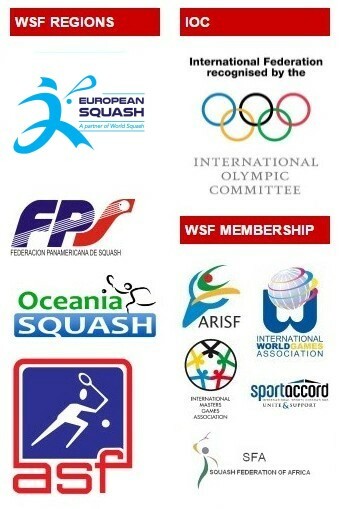 As we all know we may get a little bit older and slower, but the game is still there. 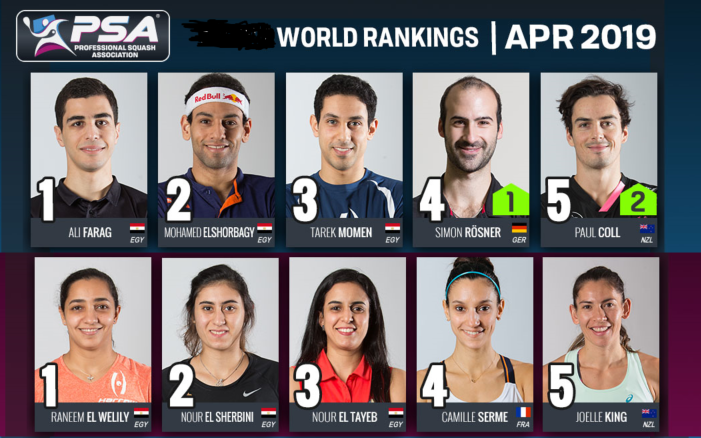 When you see the former pros reach the finals in this tournament, it’s a combination of knowledge and practicing our skills to keep ourselves up there. Is there a secret to her success? 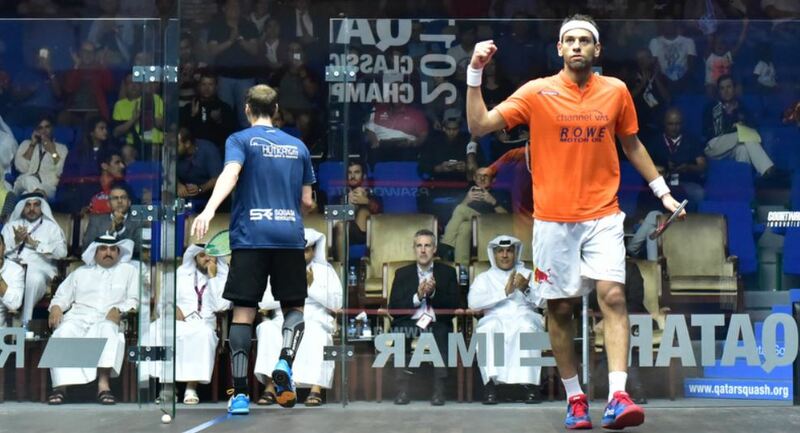 “My history, experience and knowledge is worth 50% in a match, even before the physical side kicks in as a factor. 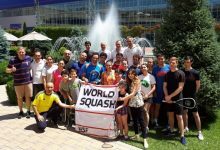 I love the event, the friendships and team spirit between nations, and just love playing. 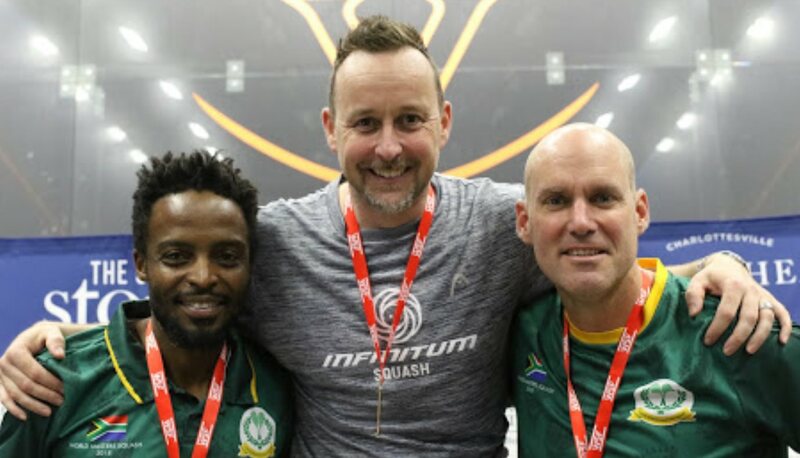 Distinguished former professional Brett Martin also provided gold medal success for Australia. 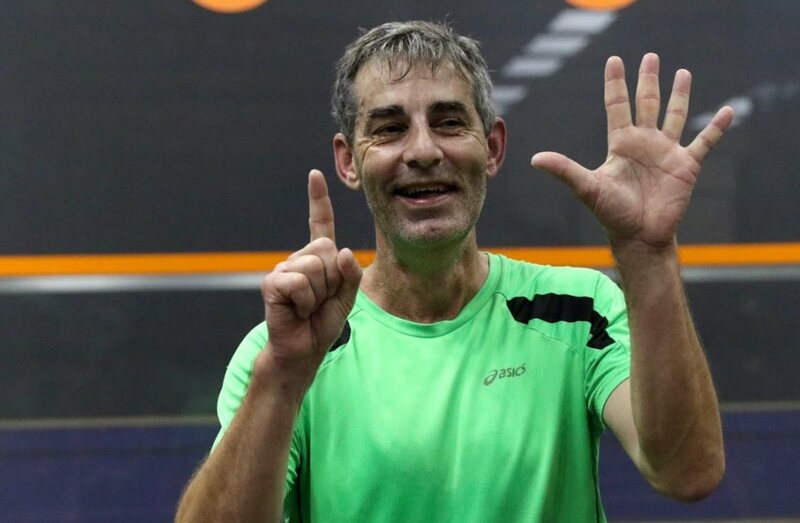 Seeded four in the Men’s O55 event, the former world No.2 followed his upset over the top seed in the semis to beat compatriot Peter Gilbee 11-7, 12-10, 11-3 in the final. 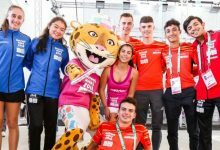 “World champion always sounds good if your name is next to it, even if you’re older, slower, greyer and fatter, world champion is world champion,” Martin said. “It’s been great to travel here and catch up with so many people I haven’t seen in years. 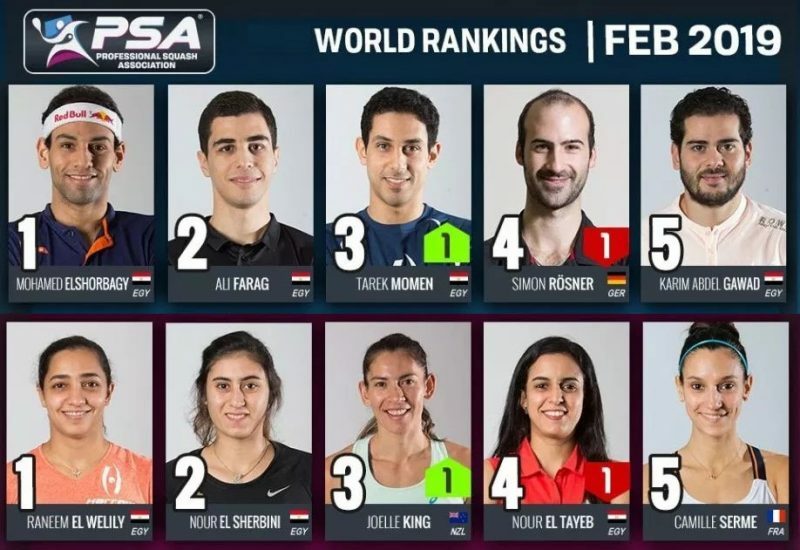 It’s fun playing in front of a crowd again, I haven’t played on a glass court in a long time, it was a bit of a strange experience. Thankfully all of the other guys had a little bit less experience than me. 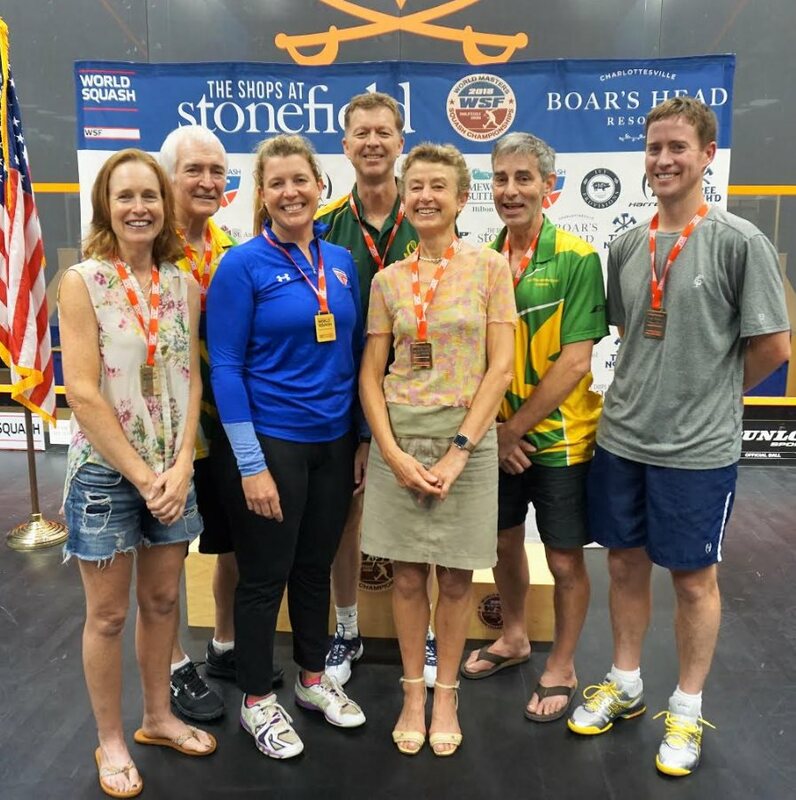 All five of England’s champions were seeded to win their respective titles, including Nick Taylor (pictured below with fellow medallists) retaining the Men’s O45 title and Ann Manley retaining the Women’s O70 title. 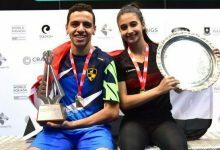 After losing in the O35 final in Johannesburg two years ago, Lauren Briggs coasted to her first World Masters title against compatriot Selina Sinclair. 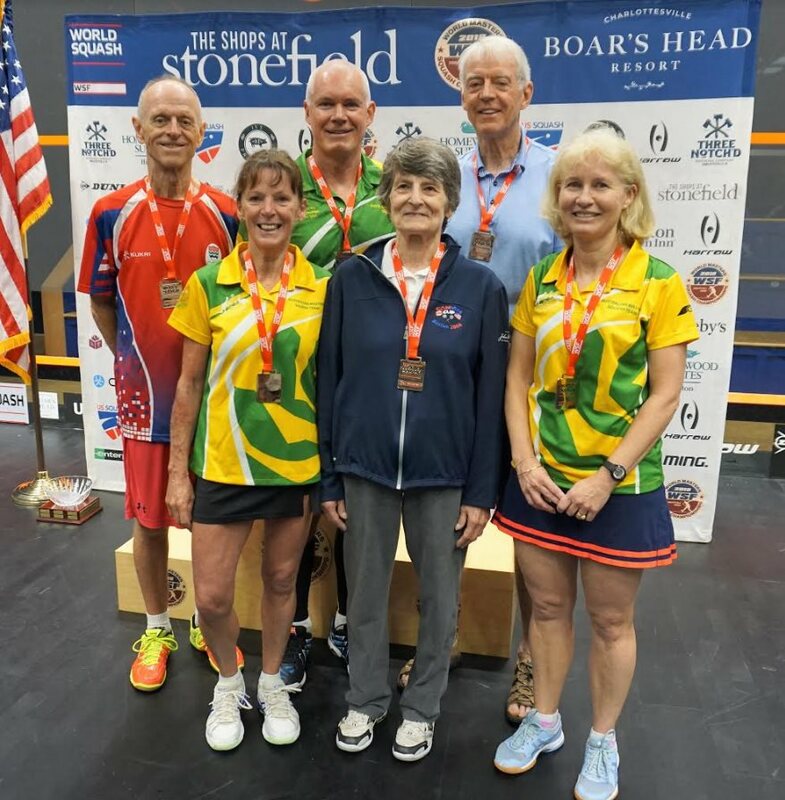 The eldest age group, Men’s O80, saw England’s top seed Lance Kinder come back from a game down against USA’s Ed Burlingame to win his first World Masters title. 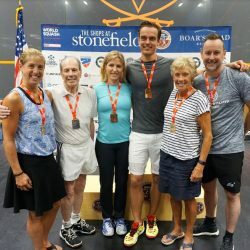 Jill Campion, winner of a U.S. nationals title, rounded out the English champions in an all-English O60 final to win her first World Masters title. Team USA’s Natalie Grainger ended the day on a high note for the home crowd, maintaining her unbeaten World Masters record with a second consecutive title-her first in the O40 division. 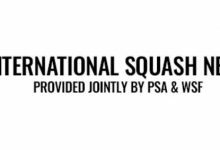 Northern neighbours Canada matched USA’s total of two World Masters champions: Men’s O75 fifth seed Howard Armitage thwarted second seed Gerald Poulton‘s title hopes in a five-game final. 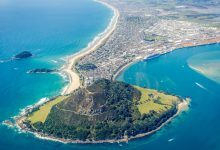 Lauren Wagner became the lowest-seeded champion by completing her surprise women’s O50 title run with an upset over Australian top seed Sarah Nelson.